A large crowd of people were at the lake in the middle of town to cheer Jeff Schulz on in his endeavors to run/walk from Le Sueur, Minn., to Woonsocket. On a beautiful Sunday afternoon, Jeff Schulz finished the last leg of his run/walk coming into his much-loved hometown of Woonsocket. As he traveled down Highway 34 from Artesian to Woonsocket, he had an immense support system with him. Many of his family members were there for every step, and members of the community joined him intermittently along the last 15 miles of his trail. As they came into town, the troupe was met and led by a fire truck from Woonsocket’s Town and Country Fire Department. …Read on and see an additional picture in this week’s issue of the Sanborn Weekly Journal. 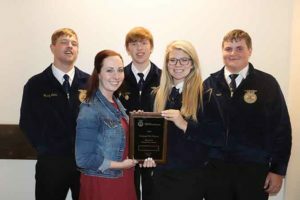 THE SCW FFA Agronomy team received a bronze award at the Agronomy CDE contest at the National FFA Convention. Pictured are Wesley Linke, Advisor Jessica Ronning, Carter Linke, Megan Linke and Collin Schmiedt. The Sanborn Central/Woonsocket FFA Agronomy team enjoyed the experience of the 91st National FFA Convention in Indianapolis, Ind. with the theme “Just One.” Team/Chapter members attending were Megan Linke, Wesley Linke, Carter Linke and Collin Schmiedt. Advisor Jessica Ronning and Chaperones Amy Linke and Paula Linke accompanied the team. For the fourth time in the past six years, the SCW chapter competed at the National level with a state-winning CDE (Career Development Event) team. This past April, at the State FFA Convention, the team not only won the state Agronomy CDE team title, they swept the top three individual places with Wesley in first, Carter in second and Megan in third. This qualified the team to compete at the National level. The group left on Monday, Oct. 22, for Indianapolis, and stopped along the way for a tour of Fair Oaks Farms in Fair Oaks, Ind. While there, students were able to take what they learned in their animal science class about hog production and see firsthand how farrow to finish barns work. While touring the dairy-milking parlor, students were able to see the dairy cows being milked on a carousel. During the early morning hours between 3-6 a.m. on Tuesday, Oct. 23, someone broke into the Country Pumper of rural Forestburg on Highway 34. The robbers got into the establishment through a northeast window, and they took a large amount of products worth a great deal of money. The Sanborn County Sheriff’s office is still investigating. They have some leads and have recovered some of the stolen property; however, no arrests have been made. The individuals who were in possession of some of the stolen property are juveniles and cannot be legally named in publication. If anyone who commutes during those hours in that area happened to see anything unusual, or if anyone knows anything regarding this crime, please contact the Sanborn County Sheriff’s office at 796-4511.